So for over a year now I’ve been giving serious thought to giving up meat, something I wrote about before. The initial spur was when I became Buddhist. Not that all Buddhists are vegetarian, nor is there a rule that says you must become vegetarian. But if you study and follow Mahayana Buddhism, it becomes increasingly difficult (I think) to align eating meat with a commitment to not harm sentient beings, and many teachings I encountered suggest this, including those from the head of my lineage. This was coupled with seeing some documentary footage on how animals are treated for food etc. and the idea of eating meat became increasingly unpalatable (pun intended). So I reduced my meat intake a lot, cutting out red meat completely, and limiting meat to weekends only, sometimes going a month at a time. My intention has been for some time to cut it out completely, my only real hurdles being that I don’t eat cheese or eggs, and many vegetarian options (when eating out) feature those. But increasingly this has improved and i’ve found more and more alternative options. What was only holding me back really was the idea i’d never get to enjoy meat again. I kept saying to myself “i’ll start in August”, or “September”. Or for a long period I decided I would never formally swear off meat, and simply avoid it as much as possible. But as I went for longer and longer stretches without meat, I became less and less comfortable with ‘breaking’, and it dawned on me I’d only be satisfied if I completely stopped. This is dreadful! Not the suffering and death of the animals, but that people suppress in themselves, unnecessarily, the highest spiritual capacity – that of sympathy and pity towards living creatures like themselves – and by violating their own feelings, become cruel. And how deeply seated in the human heart is the injunction not to take life. I felt like this was speaking directly to me: that I was suppressing an opinion I held. Which made it even worse. I actually believed eating meat was wrong, but was not being decisive about my role in it. But later that day I was walking through Dublin and I walked past a restaurant and read this in the window and I almost heard a bell ring in my mind. I just knew instinctively I was going to imminently give up meat. The slogan seemed so horribly cynical. I wonder who wrote it. 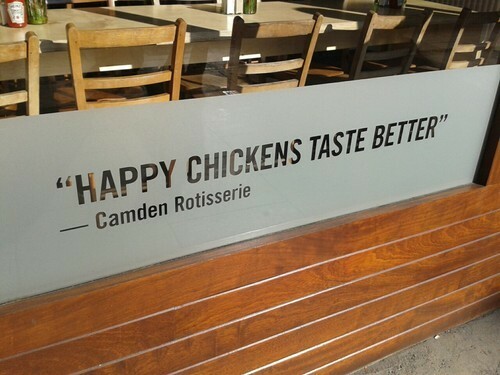 If you believed it to be true, if you believed that chickens could indeed be happy, how could you possibly eat them? It’s a self defeating statement. What it is, of course, trying to say is that their chickens are not treated cruelly, so you can eat them guilt free. But for me, they are replacing one source of guilt, that your food suffered for your enjoyment, with another. Your food didn’t suffer, but was happy. But we killed it anyway so you could have dinner. That was that. As of today, I plan to not eat meat again.